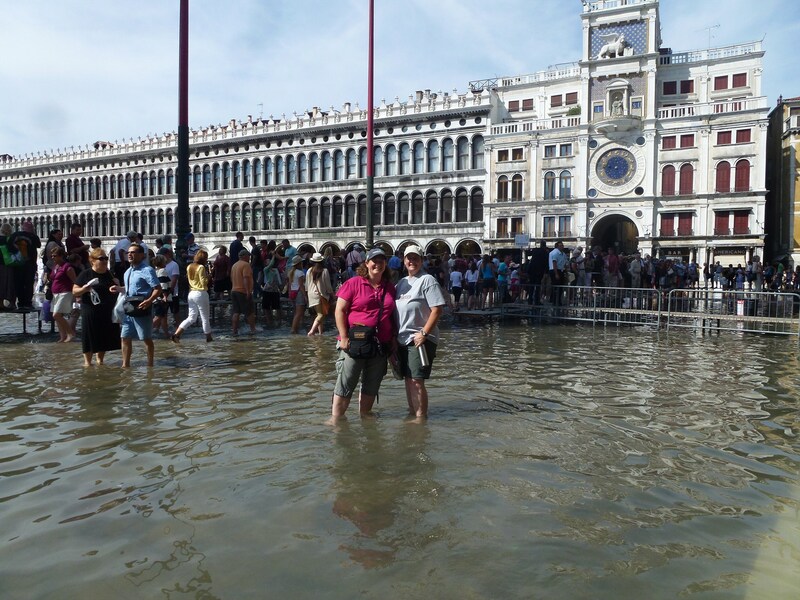 Much has been written, asked, and observed recently about acqua alta, as the once rare occurrence has become much more frequent in the past few years. A few explanations may help to understand, and eventually plan better how to face the situation so that it has the least impact possible one's time in Venice. The tide comes in and the streets get water in them; after an hour or so, the tide turns and the water goes away. The Venetians are prepared for this. 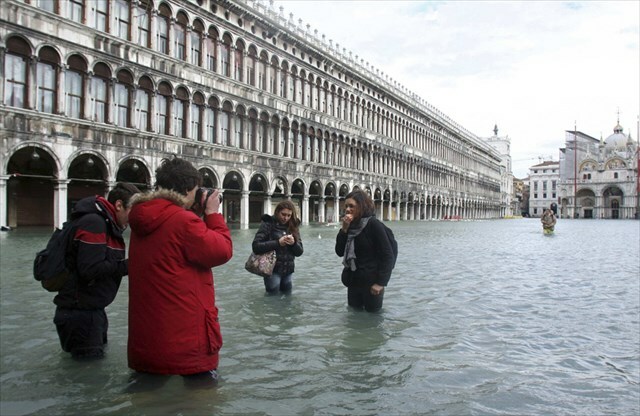 The phenomenon “Acqua alta” is the name given to the higher than normal water levels that invade the city of Venice, causing the lagoon's salt water to overflow the edges of the canals and flood the pedestrian walkways. If the levels rise sufficiently, low lying buildings also have their ground floor areas filled with the brackish water and with the backflow of drains as the sewers also fill with the excessive liquids brought in with the tide. 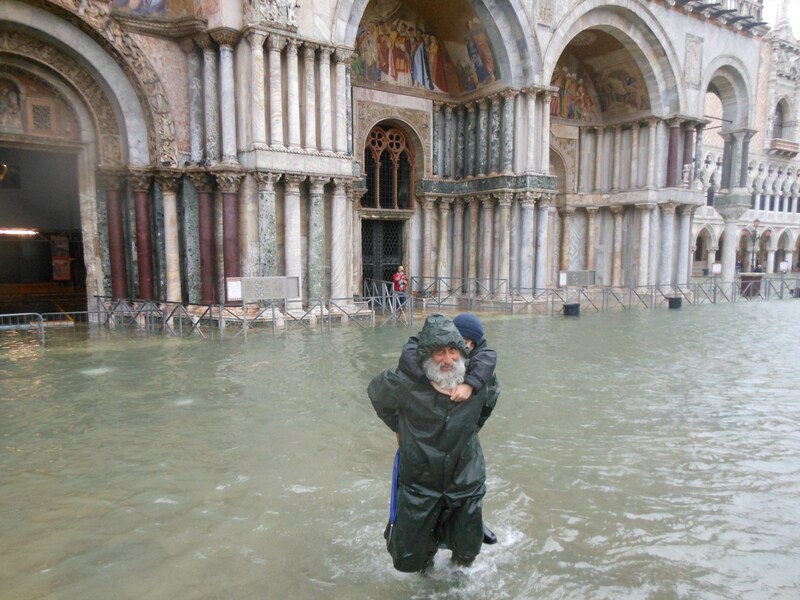 Acqua alta is an exacerbation of the normal astronomical high tide levels (“alta marea” in Italian), influenced by a number of other factors, such as wind, rain and barometric pressure. As such, the level of acqua alta generally corresponds with the astronomical tides, and follows a schedule of six hours rising and six hours falling, with one of the tides generally higher than the other. 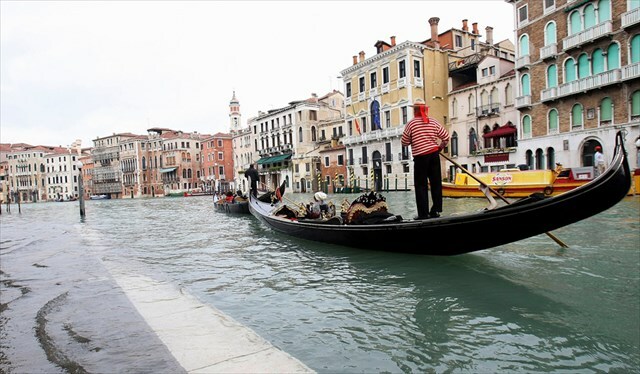 High water levels are considered “acqua alta” when they rise more than 80cm above sea level, which is the lowest ground level in most all of Venice. Acqua alta can most often occur in the colder Winter months, particularly from November to March, but lately there is no time of the year completely immune to it. What's being done The MOSE Project (acronym for Modulo Sperimentale Elettromeccanico - in English, Experimental Electromechanical Module) is a very large scale public works project currently being built at all of the connecting waterways (Lido, Malamocco and Chioggia) between the Adriatic Sea and the Venetian Lagoon. 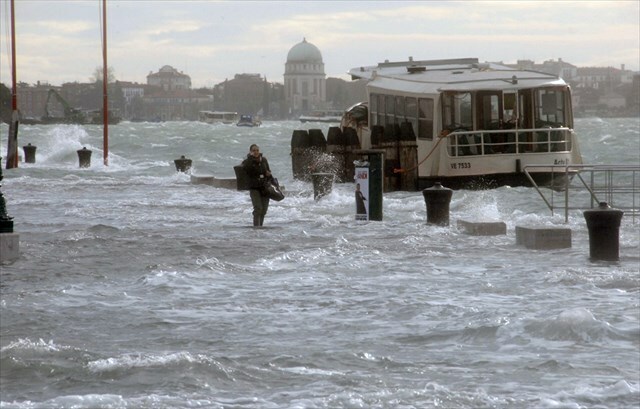 Its final goal is to block, in case of a forecast of acqua alta, the large incoming quantities of sea water at the inlets of the Lagoon before they can enter and increase the water levels inside the Lagoon. Normal tides will not be interfered with, so hopefully the delicate Venetian Lagoon ecosystem will not be impacted negatively by a decreased exchange of sea water. Unfortunately, while work is progressing the number of occurrences of acqua alta has increased dramatically, with some experts laying blame on the MOSE works themselves, which before being able to position the blocking dam elements, is actually reducing the passageways with the construction sites and support structures, creating greater difficulties for the tides to leave the Venetian Lagoon. 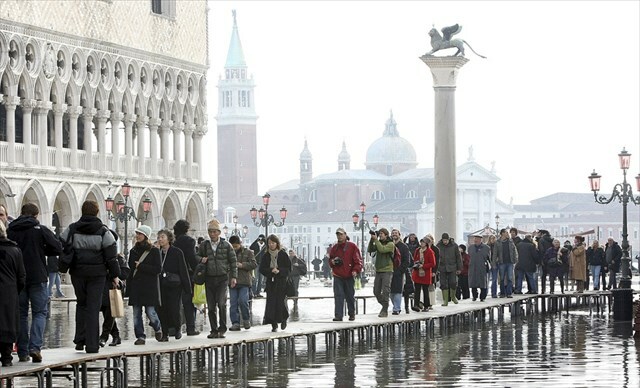 During acqua alta events, raised plank walkways (passarelle) are set out by city sanitation workers over a number of the lowest and most trafficked routes, according to a priority plan, based on the predicted maximum levels. How it impacts travel around the city When the water levels rise in the canals, two things happen to fill the pedestrian streets and squares with the salty water: the levels rise above the height of the canal edges, spilling onto the walkways and the storm drains which are always the lowest spot in an area start to overflow as the storm sewers fill beyond capacity. It is a gradual process, and the rise is generally clearly discernible to the naked eye. Very often, even when flooding occurs, the higher portions of many streets remain passable, though sometimes requiring people to pass one at a time in opposite directions. The most serious problems occur when the levels near 130cm or higher, as then a majority of the land surface of the city remains under water. When the water level is predicted to rise above 110cm sea level, civil defense sirens are sounded to warn of the coming difficulties. There are several levels, depending on the expected maximum, with the siren signal changing with each additional 10cm increase forecast. Several hours before a flood tide, you'll hear one blast on a World War II-style air-raid siren followed by a series of warning tones that forecast the expected water level at high tide: • One prolonged single-frequency tone means the water will peak at 110 cm above the benchmark of zero. • • Two tones, each ending in a rising note, indicate an expected level of 120 cm or more. • • Three tones, each ending in a rising note, indicate an expected level of 130 cm or more. • • Four tones, each ending in a rising note, indicate an expected level of 140 cm or more. What to watch out for As tempting as it may be, the first and most important rule of acqua alta is to avoid thinking of the situation as a “day at the beach” and wade barefoot as a Venetian adventure (since it occurs more often during the winter months, it is usually not that tempting anyway). It is very easy for rubbish or other people's discards to remain submerged and out of sight, presenting serious danger to the unaware. Sometimes areas of temporary construction or excavation along the streets are covered with wooden planks after work has finished for the day, and these may float a short distance away, leaving the holes hidden under the water. If it is necessary to pass an area of high water, there are a number of solutions available, from single-use plastic slip-over boots which cost anywhere from €7.50 on up, to standard below-the-knee rubber boots, which begin at €15 and going into elaborately decorated fashion statements at corresponding fashion boutique prices (as much else, costing more the nearer you are to San Marco or to the train station). These will not lessen your need for caution when walking over unseen ground. 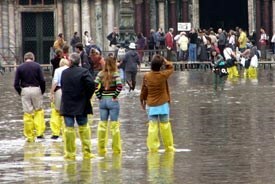 For most routes, for most of the acqua alta events, higher hip-boots or fishing waders are not necessary. Further information One of the easiest to find sources of a good amount of information about acqua alta is the City of Venice website itself. Unfortunately not all the information is available in English. (You may copy and paste the URL into translate.google.com for a reasonable translation). The FAQ page answers a number of questions. However it is not completely up to date and underestimates or side-steps some of the more serious questions or issues with typically political PR spin. It is still a good place to start. To log this cache, email the answer to 2 questions. 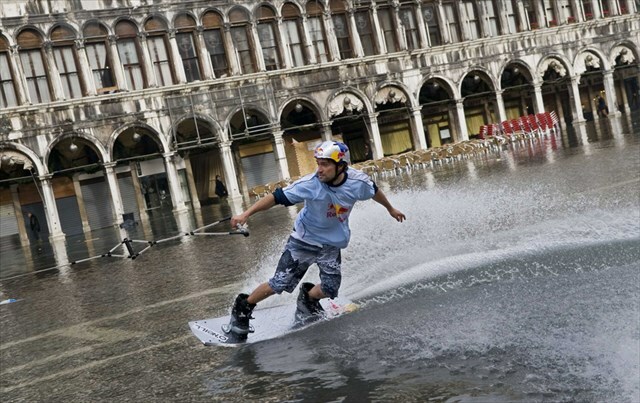 What year was highest water level reached in Venice? What is the name of the building at this location.? ?